Fabric Mart Fabricistas: Made by a Fabricista: Mint Chocolate Momma. I love the whole look and agree that the Juniper fits you very well. I love the top too! I left off the yoke facing because I was thinking it would be unruly in ponte! So I didn't realize the instructions had you apply it that way. if I remade this in a lighter fabric, I'd use the facing. I wish I had gone with my gut and left off the facing...but I think as long as I stitch up the exposed seams of the neckline binding (I don't have enough of a seam allowance to serge or properly bind up) with a v-shaped stitch, I should prevent some of the fraying. I guess I could always apply fray-check, too, but would prefer not to. :-) I loved your version and I was glad I could reference back to yours for sizing and fitting help!!! This was a good read, thanks, and your outfit looks great! And huge thanks for mentioning hem clips. I had never heard of them before. They look amazing!! I must track some down right away! Love your stylish outfit and the combination of fabrics! Very reminiscent of Eileen Fisher! Wow! Nice outfit. 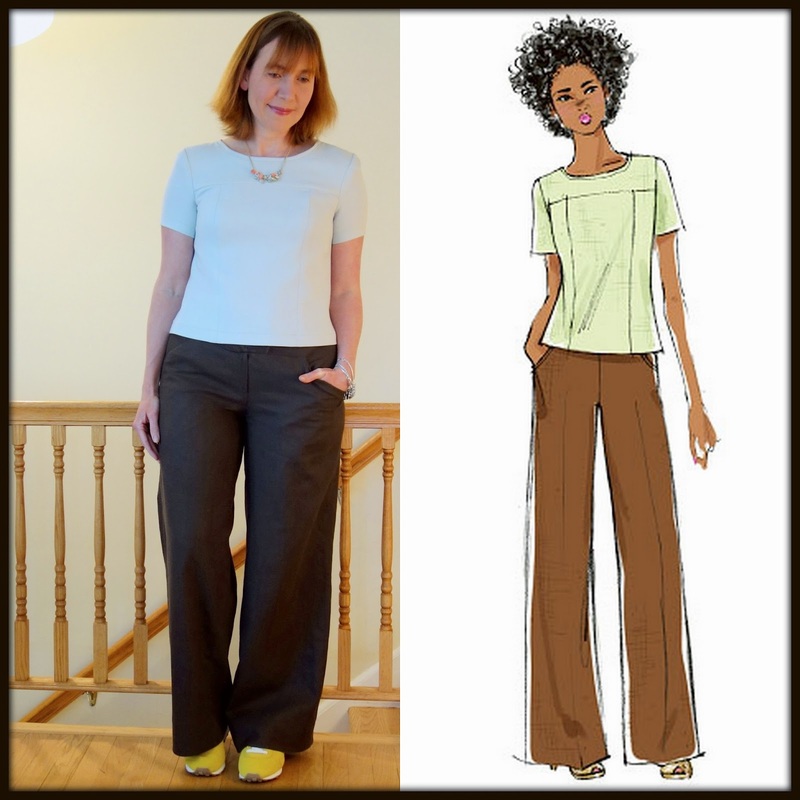 Yes, you do look like the Butterick pattern cover! A great pulled together look for your activities with the kids, and running around town. The fit of the pants on you are awesome. You seem to have gotten the adjustments precisely to your body. Fitting is always a challenge for me too. I am very tall with the same fitting issues. Thanks for sharing a detailed post. It is so funny being so petite and small on top but having a near plus-sized and LONG bottom half. I feel like something got screwed up in the process. Haha. But I know I am not alone! Good luck with these pants if you decide to make them up! And yay for long long inseams, amiright?